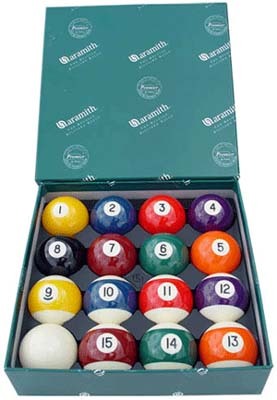 Aramith Premier Belgian Pool and Billiard Ball Set with 2-1/4" Cue Ball. Standard size - 2 1/4"
Standard Weight - 6 oz. Number in the White(field) - 9-15 Balls. Weight, Hardness, & Roundness all Meets International Billiards Standards. Worldwide Endorsement - Aramith Phenolic Balls are Used by Most Professional Tours, Federations, and Amateur Leagues.